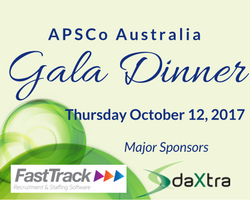 DaXtra is proud to sponsor the APSCo Australia Gala Dinner 2017. The APSCo Australia Gala Dinner and Awards Night is the association’s major event of the year and provides an opportunity to recognise those who have supported the association and/or achieved excellence and is a chance to network, be entertained and enjoy the company of colleagues in a stunning setting. You might remember that we announced the opening of our Australia office three months ago, right in the heart of Sydney’s central business district. Thanks to the strength of our relationships in the local market, we’ve managed to grow this business from our Asia base in Hong Kong over the past few years. Now, the time has come to put our feet firmly on the ground, and make a greater commitment and contribution to the local economy. We are delighted to support APSCo and look forward to seeing many of you at the event!